Mohsin Hamid's second book after the critically acclaimed "Moth Smoke", "The Reluctant Fundamentalist" follows a young Pakistani-American named Changez who gains entry into the elite world of Princeton University and corporate America and then gradually becomes disillusioned with his life. An outsider to the world of the rich American elite, he nevertheless excels in it. His efforts lead him to work for a top firm called Underwood Samson, doing business analysis and profit forecasting jobs around the world. He remains absorbed in his work, although never fully absorbed into the lives and attitudes of his colleagues, until the events of September 11th, 2001 propel some intense soul-searching, causing him to wake up to the life he had been living. Even as Changez is waking up, the girl he has been pursuing the whole novel--the beautiful Erica--is slipping deeper into a nostalgia for her dead lover Chris. These two parts of the narrative work quite beautifully together. The book would be another (beautiful) coming of age story but for the unique voice of the narrator, who tells his whole story to "you", a mysterious American stranger and also the reader. We shall return to this shortly, but first a word about the meaning of Erica. Many reviewers have commented that Erica and her "nostalgia" are a thinly veiled metaphor for post-9/11 America (One reviewer suggested that Chris meant Christopher Columbus, in which case Erica's malaise is symptomatic of America's longing for the beauty of its founding myth). Indeed the narrator's name is a not so subtle riff on those Muslim Western-educated young people from India, Pakistan and elsewhere whose lives were changed by 9/11 and the discrimination they faced in its wake. However the changes Changez undergoes feel forced and compressed at times--he seems like a man too immured of Western comforts and ideals to abandon them as quickly as he does. No doubt Erica's fate prompted some of his alienation. But all-together his transformation feels too compressed; this sabatoges the novel's otherwise uncanny realism and subtle emotional depth (especially the passages dealing with the emotions and betrayal of relationships). Still this is a strongly written book overall. When Changez is fired from his prestigious job and returns to Pakistan, he does not become the radical mullah or Islamist leader one would expect from the title. More true to his character, he begins teaching at a university, becoming more radicalized through his contact with the students there. Although he is thrown in jail for organizing protests at the embassy, it is not until he makes statements about the USA in response to what he believes is an unjust detainment of one of his students that he comes to the attention of the American government. 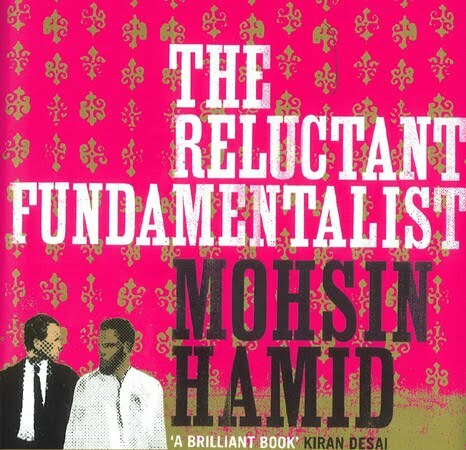 The reluctant fundamentalist then, refers not to the aspects of his life in Pakistan, but to the corporate persona he assumes at Underwood Samson, where he is trained to always "focus on fundamentals". This inversion of the reader's expectation is brilliantly executed and makes the final scenes all the more ambigous--we wonder if Changez is executing a brilliant plan of attack or attempting to save his own life. From a stylistic point of view, this novel is a unique achievement. From a moral point of view it offers a strong critique of US foreign policy and the dangers of intervention and playing "world policeman". All told it is the emotional investment in the central character--his compassion, his ambition, his gentility and his disillusioned break with complacency--that makes the moral impact of the novel so resonant in these times.